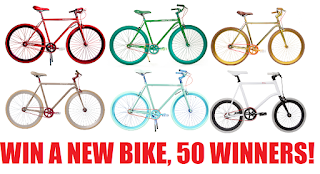 Prizes (50): The prize is a Martone bicycle (each, a “Prize”). The Prize model and style will be selected by Sponsor at its sole discretion. Fifty (50) Prizes will be available in the Promotion. The Approximate Retail Value (“ARV”) of each Prize is $895.00.